Today is a day on which The Wedding inevitably seems to dominate the news. Royal affairs take pride of place for at least one day. Tomorrow Dutch people will continue creating a royal atmosphere on Koninginnedag, Queens’ Day, the birthday of the late Queen Juliana. When Queen Beatrix ascended to the throne in 1980 she decided to maintain April 30, her mother’s birthday, as Queens’ Day. Since her own birthday is on January 31, in midwinter, it was very sensible to keep this holiday fixed in springtime. To the best of my knowledge the vrijmarkten, the free markets on Queens’ Day, have gained any importance only after 1980. Before that time this kind of flea market was not a large element of the activities on Queens’ Day organized by the Oranjeverenigingen, the local societies which honor the Dutch royal house. A pageant with music by a brass band, hoisting the national flag and the orange-colored pennon, all kind of games, folklore activities such as traditional dances and music, sport and activities for children used to be the main elements of Queens’ Day. The royal family maintains since 1980 the tradition of visiting on April 30 a village and a town to participate in these activities, which can be rather home-made and for teenage princes even outright boring. Perhaps they were painfully aware of the character of these visits, an invented tradition. The late Queen Juliana had established the tradition of a pageant of loyal citizens parading to the palace at Soestdijk presenting the queen with all kinds of presents. Some young princes found even that difficult to digest. However, since the introduction of the free markets on Queens’ Day this new custom clearly outstripped other activities in scope, scale and importance. 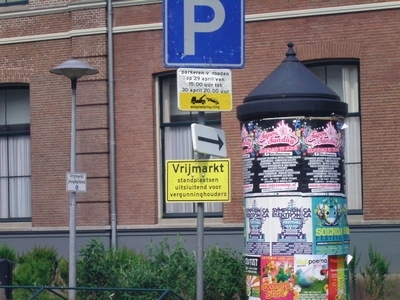 In particular the free markets in Utrecht and Amsterdam have become mass events. A few days before the official start the local councils mark the area in which the free market will be held. On the eve of Queens’ Day, and in fact already hours before the Queens’ Night as it has been named, people show up with the things they would like to sell. At the start the whole things still resembles the original intention of the free market, a market where you can wander around at ease and wonder about the things on sale, strike a bargain with someone and go home with a funny object for a very nice price. Tomorrow you will find yourself back in the midst of an enormous crowd, people might sometimes be a bit less likeable, and you will probably look in vain for something worth all your efforts to enter Amsterdam or Utrecht at all. My problem is not with the free market as such. The city council of Utrecht has restricted the area of the free market to the northern part of the old city, leaving the other more beautiful parts in quiet and peace, and it is wonderful to enjoy them. In Amsterdam the Vondelpark has been delineated as the children’s area who can perform music or funny acts for some money in exchange, adult people can bring their stuff and merchandise to the other streets and squares of the free market. How to approach the subject of the free market, as an anthropologist or as an ordinary citizen, as an economist or as a political theorist? How to avoid easy jesting and tradition bashing? And maybe the most obvious question, what does legal history have to do with the free market? To some extent this one day free market seems to encapsulate the virtues and vices of the concept free market. For me the traffic signs used to mark the areas seem to signify both the geographic and the conceptual limits of the free market. What started as a funny imitation of a flea market has grown to an oversized real open air market. Instead of people willingly bringing things from their attics to the street and behaving like one day merchants they behave like real merchants, claiming the best spots, pushing away others and setting themselves the goal of getting profit out of it. 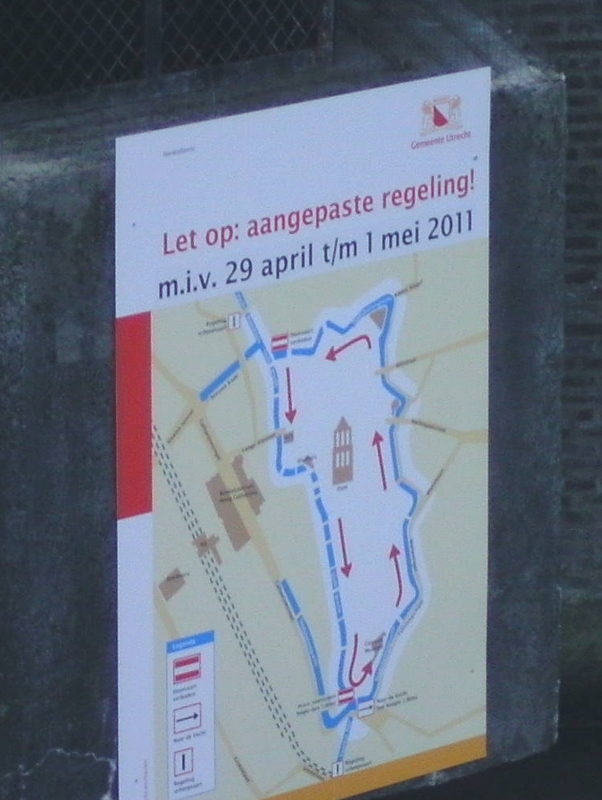 If ordinary and would-be merchants can try to claim a spot, the inhabitants of the streets within the official areas have reacted the right way by putting signs at their windows, and using even a kind of semi-official looking poster showing the queen saying “Reserved for occupants”. A second thing to note is the sheer scale of regulations needed to ensure safe proceedings. 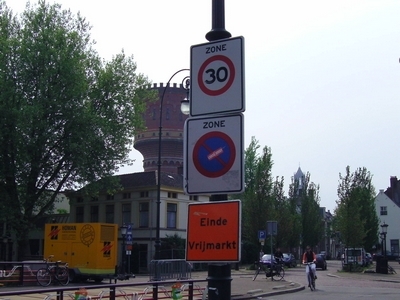 According to the local news station RTV Utrecht 220 traffic signs are needed to mark the zone free market. In the past providing food and drinks to visitors of the free market turned out to be the weak spot of the whole concept. Merchants entered the areas with dozens of booths and occupied the places meant for the one day free traders. The number of permits has been lowered to just 55 stalls. With the permits and the traffic signs come hundreds of volunteers to keep things running smoothly. Today I was at first slightly bewildered because of a road sign about permits, but its explanation is clear. When an estimated half million people are going to visit Utrecht – and even more Amsterdam – police regulations are clearly needed. Let legal history enter! In medieval times a free market, a vrijmarkt – Freimarkt in German – was a market to which merchants and traders could freely come. They did not have to pay the normal entrance fees, they enjoyed protection against juridical actions, in short they only had to show their skills as merchants and to obey the proverbial laws of the market: selling their ware honestly, paying with good currency, and guaranteeing the quality of the products sold insofar as indicated by law. 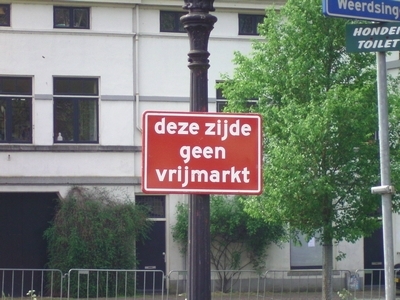 The rules of the present day free markets in Utrecht and Amsterdam are pretty straightforward. One can view them as extensions of the normal general police regulations (Algemene Politieverordening). Most salient is the strict prohibition for private persons to sell drinks. In view of the expected number of people visiting Utrecht and Amsterdam by boat, and the use of alcoholic beverages by the guests aboard, it is no surprise the traffic in the canals around the city center of Utrecht has been restricted temporarily to one way traffic. 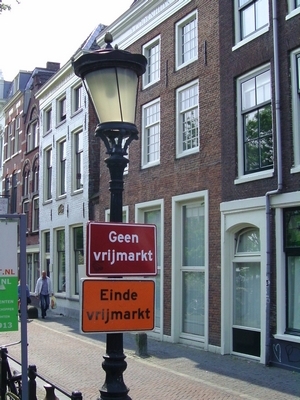 In Amsterdam this would not be as easy to propose and enforce as it is in Utrecht. What happens to the goods not sold after the closure of the free market at 6.00 PM? Taking your things back home is one option, leaving it as garbage is perhaps another way, and anyway tons of garbage have to be cleared away, which calls for a major effort of the municipal cleansing departments. Instead of taking your stuff down from your attic or from your shed and bringing it to the free market many people prefer the virtual markets on Internet. We Dutch have our own variations on Ebay such as Marktplaats and Marktplaza. Why take the trouble of going to the vrijmarkt? What makes people connect selling your things on the street with a royal holiday? Is it just showing what seems to be an innate part of the Dutch character, being at heart a merchant? One can enjoy this feeling going to the virtual market squares, too. Perhaps even closer to the Dutchman’s most inner feelings is the penchant for free things. Nowadays this royal holiday seems to combine perfectly with an almost royal liberty to behave for just one day as a real merchant. Having the feeling you are at liberty to do what you want during such holidays goes indeed a long way. It seems Queens’ Day is a more jolly holiday than May 5, the Dutch Liberation Day. Notions of citizenship, of having to fight for freedom in order to be worthy of freedom, in short conscious efforts to make the celebrations more serious give this day an ideological load which does not weigh upon Queens’ Day, and this is enforced by the acts of remembrance of the Second World War on May 4. 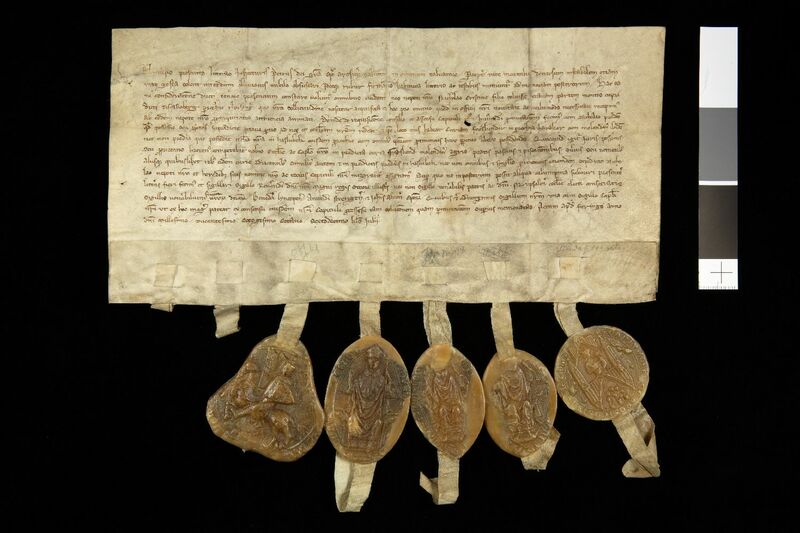 Putting things into perspective is one of the goals legal historians should strive for. On the congress calendar of this blog I cannot include one day events for reasons of space. It seemed fitting to make an exception for this yearly one day event, an event starting the night before really! This week Mary L. Dudziak noted on the Legal History Blog an article citing the famous saying that the American constitution was not intended “to embody a particular economic theory”. The Dutch one day free market seems to be full of signs and symbols which merit some attention. Very ordinary things have their name already in Roman law, res cotidianae, and such common things are often the bones of contention, not only the loftiest concepts and aspirations. After checking the spelling and publishing this post it took me some time to realize one can spell one of the most often occurring words in several ways. I used the spelling Queens’ Day, which strictly speaking refers to a day celebrating two or more queens. 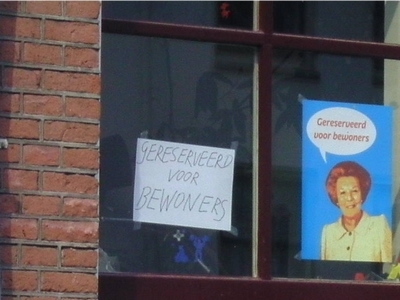 April 30 was Queen Juliana’s birthday, Queen Beatrix continued the tradition, so this is perfectly correct. However, the Dutch word Koninginnedag refers to just one queen. Incidentally I remember using as a kid the more difficult way to pronounce the word koningin, and my sister loved to get me saying it... The English language provides us also with the possibility to write Queen’s Day and Queensday. The website of Queens’ College Cambridge can tell you more about “That Apostrophe”. Since 2013 with the new Dutch king Willem-Alexander the traditions of Queens’ Day have been moved from April 30 to April 27, and the day is now called Koningsdag, King’s Day. 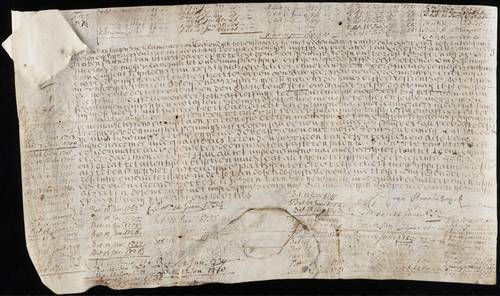 This entry was posted in General and tagged Commercial law, Flea markets, Free market, Legal history, Netherlands, Royalty, Utrecht on April 29, 2011 by rechtsgeschiedenis.